While developing Emberlight, a visual knowledge collaboration server, it became clear that research at the time on version tracking didn't account for two-dimensional visual information. This paper proposes an approach to comparison of spatial hypertext collections which avoids becoming entangled in complexities of version management and merging. We also propose and illustrate principles for presenting comparisons of spatial hypertext without losing important implicit information. We argue that multiple view options, distinct areas for different collections, and dependency lists are all necessary if comparison is to retain the kinds of meaning fundamentally important to spatial hypertext. Writing this with David during the acquisition of Texperts by KGB and the launch of our services in the US was challenging, but very rewarding. 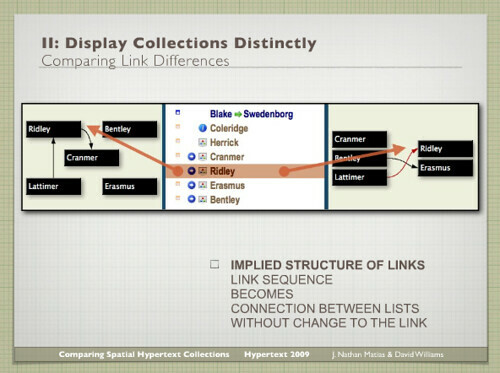 We presented the paper in Torino, Italy, at the 2009 ACM conference on hypertext and hypermedia.